About a week ago we had an unusual visitor to our feeders. The visitor himself wasn’t all that unusual, but his presence at our feeders was. 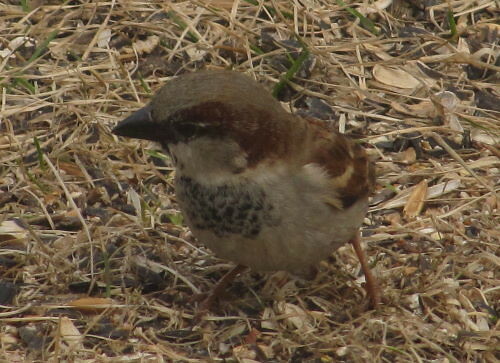 It was a House Sparrow, what seemed to be a young male, all by his lonesome. House Sparrows, like starlings, are among our most well-known and widespread of North American species (somewhat ironic that they’re both introduced), and yet neither occur with much regularity in the rural landscapes where I live or have lived. This is the first House Sparrow I’ve ever had visit one of my feeders (with the exception of the couple of years spent in town, of course). In the country, they’re almost exclusively associated with farms where they pick through spilled grain and the grass seeds from hay. I love House Sparrows. If I had to draw up a list of my top five favourite species, House Sparrows would be in there somewhere. There’s just something about their ever-cheerful chirps that can warm my heart even on the coldest or wettest days. If I hadn’t had House Sparrows or starlings about during the years that I lived in town I think I would have had a much harder time dealing with living in an urban environment. And yet, when I saw this guy at our feeder, I had very mixed feelings about it. On the one hand, it was pretty cool to see a new bird for our yard, and one of my favourites, at that. But on the other, I worried for our Tree Swallows and bluebirds. House Sparrows are notoriously vicious birds, when it comes to disputing property rights. If they want a box, by the phoenix’s last feather, they’re going to have that box. Even if it means murdering the previous tenants. They can not only oust your native residents, they can really damage your local population, because the youngsters from a successfully fledged brood will return to their natal territories and set up shop themselves and before long you’re supporting a small colony of them. Then it becomes a lot of work to try to cull your colony (like Julie Zickefoose was forced to do a few years ago; what happens to the sparrows after they’re caught is up to you, but since they’re non-native and not part of the Migratory Species Act you could choose to keep them as pets instead of euthanizing them) in order to let the native birds come back. Still, one sparrow does not an infestation make, and I figured we’d just let him be unless I saw him eyeballing any of the boxes, or hanging out with a girlfriend. In fact, he seems to have moved on since then; we haven’t seen him in a few days. You might be surprised to learn that the House Sparrow is actually declining in Ontario. Between the first Ontario Breeding Bird Atlas and the second (a span of 20 years), the probability of observation* for the species declined by a statistically significant 20%. Most of this decline took place in the Lake Simcoe-Rideau and Southern Shield regions. The border defining the separation between these two adjoining regions is the southern edge of the Canadian Shield, and helps to explain why these are the regions most affected. These areas represent marginal farmland at best, and as agriculture became more industrialized, especially in the prime farming locations in the east and southwest of the province, these low-quality farms were abandoned or allowed to grow in such that they’re no longer suitable for House Sparrows. That said, similar declines have also been noted in Breeding Bird Surveys across Canada as well as in Christmas Bird Count data. *The probability of observation is one of those annoyingly specific, technically-correct terms that had to be implemented for the atlas to convey what it was the statistics were actually calculating. Because of the way the data was collected, there was no way to compare absolute numbers of the populations of species. Even the absolute number of atlassing squares the species was found in can’t be compared perfectly because of an increase in effort during the second atlas. So what they’re comparing is the probability that the species will be detected in any given square within the first 20 hours of fieldwork. The black bibs of House Sparrows are a social signal. Many studies have shown that the most dominant males (often, but not always, the oldest) have broad, solid black bibs while young and/or subordinate males have smaller, mottled bibs. (Wikipedia suggests, however, that other studies have not concluded this.) This guy is clearly ranked somewhere at the bottom end of the pecking order. I can only presume that he’s scouting the landscape, looking for a place to set up his own territory. 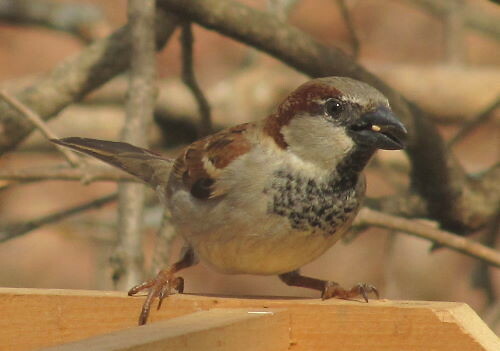 Since House Sparrows are largely sedentary, rarely moving more than a few kilometers/miles, I suspect he came from the sheep farm at the end of the rail trail that I often walk to with the dogs, where I often hear them chirruping. I hope he found a nice place to call home – preferably somewhere away from bluebirds and other native cavity nesters. 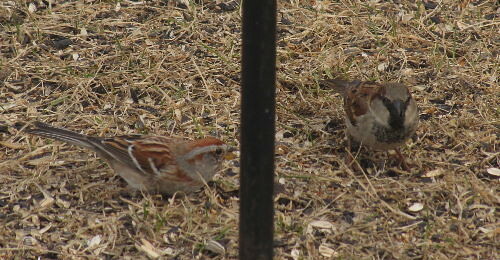 We have house sparrows living in the area, but luckily I haven’t seen them in my backyard yet. Chickadees like to use my nest box, I’d like to keep it that way! 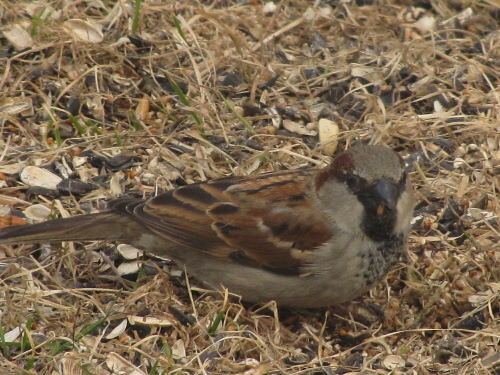 Interestingly, I’ve heard from other bloggers that house sparrow populations in England are declining significantly. A very interesting observation! Incidentally, the population of House Sparrows in India, where they are native, is also going down. It is associated with fierce competition with House Crows for food, loss of nesting habitat and supposedly with the increase in cell phone radiation, but I don’t think it has been proved yet. I wonder if the change in weather is also responsible for their decline? Their numbers are down in the Midwest US too, though they are still abundant. I watched a pair of Carolina Chickadee chip away a cavity in a soft dead wood in my neighbor’s tree a few years ago. They worked long and hard, only to lose it to a pair of House Sparrow. Lake Simcoe is awesome cottage country. The sky is like you wouldn’t believe in the city, you can actually see the Milky Way and smaller and smaller stars in between each other. Oh, look! There goes the satellite :-) Still, there are all usual stores nearby. Since house sparrows are not protected by the international migratory bird act -they’re not native to the american continent- it’s not only legal but also encouraged that you “humanely” control their population, to help protect other song birds and cavity nesting birds that are native to the Americas. I do my my part by installing repeating sparrow traps around my property. That way, I am doing my share in trying to help the populations of native song and cavity nesting birds thrive and come back up to normal numbers. Last year alone I trapped and humanely disposed of 84 house sparrows. The numbers of cavity nesting birds -including purple martins, tree swallows, downy woodpeckers and chickadees- has significantly increased in the area where we live (southern Saskatchewan), thanks to informed and educated “birders” like myself.